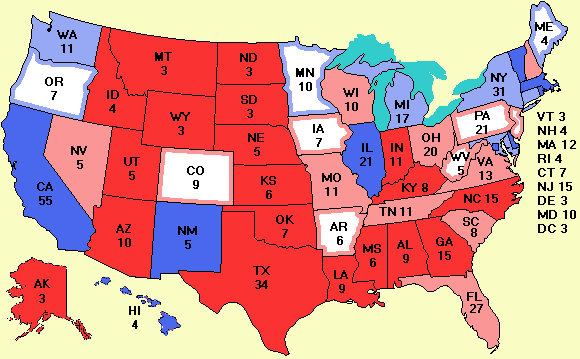 Mason-Dixon has surveyed six swing states: Arizona, Missouri, Nevada, New Hampshire, Ohio, and West Virginia, and Bush is ahead in all of them. And unlike some of the other pollsters who work for one side or the other, Mason-Dixon, at least claims to be neutral. Noteworthy today is that even New Hampshire has switched to Bush, bringing his score in the electoral college to 331, its highest level since this site went live on May 24. But it is important to note that many states are still very close and could change quickly. A reader pointed out another block of voters who are missed in telephone polls: people using Internet telephone companies such as Vonage. Early adopters of new technologies like VoIP (Voice over IP) are typically highly skilled urban professionals with college degrees working in modern industries. This is prime Kerry territory. Their numbers are still small, but here is another example of voters who are predominantly pro Kerry being undersampled by the telephone polls. As a compensation, they are likely to be oversampled in Zogby's interactive polls. In any event, this raises yet another methodological issue. VoIP raises another issue: area code. Some of the VoIP carriers allow the customer to pick the area code. One reader from Chicago said his Vonage phone number has a Georgia area code so his mother in Georgia can call him without incurring long-distance charges. This effect means if a pollster did call him, his vote would be counted in the wrong state. Another point that was brought up is that if a pollster gets a list of people who voted last time, first-time voters will be omitted. A correction can be applied for this effect, but it will have all the uncertainties discussed yesterday. And as usual, there is a new cartoon of the week.